There was an article in The New Yorker a couple of years ago, which you can read here, about the current trend toward dystopian science fiction novels for YA — young adult — readers. The most prominent example of the trend, especially at the moment, is Suzanne Collins’s The Hunger Games, the film version of which just had one of the most successful opening weekends in movie history. (Actually, it’s the first of a trilogy, so there are at least two more films coming, more likely three given the current trend to break the last book of a YA series into two films as a way of giving the cash cow an additional udder to milk). I read the entire Hunger Games trilogy about the time the final volume came out in the summer of 2010. (Those of you dying to read my review can find it here.) It’s an immensely readable series of books and I gobbled it up in about a week, as have apparently about a billion or so teens (and possibly as many adults) around the world. 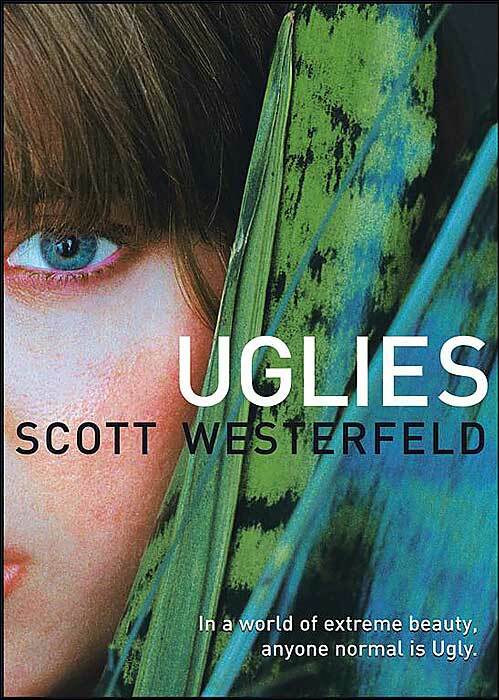 I enjoyed it so much that I began looking around to see what sorts of things other YA writers have done with dystopian themes and somehow alighted on Scott Westerfeld’s Uglies series. Let’s just say my results were mixed. Here’s a quick sketch of what the Uglies books are about: The first volume, simply titled Uglies, takes place two or three centuries in the future, after our society has pretty much strip mined and clear cut the planet to the breaking point and then gone defunct. (Ironically, the strip mining and clear cutting aren’t why our current society — known in the future as “rusties,” because we left so much abandoned metal behind — no longer exists. What we actually did wrong was to inadvertently engineer a bacterium that eats reserves of petroleum and, whoops, there goes our continuing dependence on the internal combustion engine.) To rectify the mistakes of the past, society has rebuilt itself as a loose network of relatively small cities separated by deliberately preserved wilderness and our energy needs seem to be largely supplied by solar power. Transportation not involving walking is mostly handled by magnetic levitation, which allows not only for cool hovercraft and high-speed maglev trains but airborne surfboards that kids can use the same way skateboards are used today, except even more recklessly. It’s not reckless hovering that puts the dys in this particular topia, though: It’s cosmetic surgery. People have become obsessed with looking physically perfect. Radical surgical procedures have been developed that can make almost anyone flawlessly beautiful at the age of 16, after which they may become older (or, in the book’s futuristic slang, “crumbly”), but still remain kind of hot. Alas, Tally makes friends with someone from a bad crowd — and in a dystopian novel “bad crowd” usually means “group of rebels who discover that things aren’t as nice as they seem.” What isn’t so nice in Tally’s world, it turns out, is that the prettifying surgery tends to be accompanied by some unpublicized brain surgery, where people are made almost literally airheaded by having little holes punched into strategic locations in their forebrains, to keep them docile and less likely to do the stupid sorts of things their ancestors did. Through a convoluted series of events, Tally is blackmailed by the secret police (scary-looking Pretties, as oxymoronic as that may sound, known as Special Circumstances, or just Specials) to infiltrate the rebels, who live in a secret location called “the smoke,” where she is to broadcast their location and betray them. Naturally, Tally turns out to like the rebels but accidentally betrays them anyway, allowing for tons of action in the second half of the book. As silly as I make all this sound, Uglies is actually quite readable and more than a little fun. As semi-mindless entertainment goes, it’s worth a read, by which I mean a read by human beings over the age of 15. (Human beings 15 and under probably don’t need the encouragement.) Unfortunately, Westerfeld didn’t stop with one book, and I found that the continuing adventures of Tally Youngblood grew continuingly more tedious as the trilogy went on. (Tally herself, who seems to go through a dire but logically justified personality change with each volume, also becomes continuingly more obnoxious.) By the climax of the third book, which completes the initial plot arc, I was ready to quit. But the fourth book of the “trilogy,” appropriately entitled Extras, offered a brand new heroine and a brand new premise, so I decided to stick it out. And I didn’t entirely regret it. By the time the events of the fourth volume roll around, about three years have passed since the end of volume three and, this being a dystopian thriller, you can guess that major changes have taken place in society since volume one began. In the society of volume four (which seems to take place mostly in and around an unnamed city in Japan), the idea of becoming Pretty at age 16 has been abandoned and people have started doing their own thing. Some still become Pretty, some stay Ugly, some just become weird. In other words, it’s a kind of free-for-all society and it’s entertaining to read about for a few chapters. The heroine is a teenage girl named Asa Fuse, who’s a “kicker,” someone who generates news stories with her own hovercam and broadcasts them via whatever future equivalent of the Interwebs is currently in use. She falls in with, yes, a bad crowd and together they stumble on a strange plot to build mass drivers — basically, magnetic guns the size of mountains — that can fire immense bullets into the air with the kinetic potential to destroy cities, which appears to be what they’re going to be used for. Westerfeld is a competent writer and has the sort of lean, muscular, somewhat superficial style one would expect of a YA science fiction writer. He also has that magical ability that makes you just curious enough to know what’s going to happen that you keep turning the pages. But that’s not really what you want to know, is it? What you really want to know is: Are the Uglies books as good as the Hunger Games books? Of course not. This series was actually published shortly before the Suzanne Collins novels, but nobody has leaped at the chance to make a blockbuster movie series out of it yet, have they? So clearly Westerfeld lacks the Collins touch. But why exactly aren’t the Uglies books as good as The Hunger Games volumes? I mean, the plots are similar. A teenage girl gets caught up fighting the authorities in a nasty, totalitarian future society and finds courage and self-confidence through the act of defiance. It’s a highly kickable premise, as Asa would say. What exactly does Westerfeld do wrong? By the way, if there’s any moral to be gleaned so far from my survey of YA dystopias, it’s that the dystopias themselves are purely plot devices. Brave New World and 1984 were genuine warnings about the excesses of human behavior, but despite Westerfeld’s sloganeering against strip mining, clear cutting, genetic engineering, obsession with beauty, et al, the dystopias in both The Hunger Games trilogy and the Uglies series exist mainly just to be mean to people. After all, every thriller needs a good villain. These days, in the world of YA fiction, dystopias are it. Posted in book reviews, books, dystopian, dystopian fiction, extras, pretties, reading, science fiction, scott westerfeld, specials, Tally Youngblood, The Hunger Games, uglies, YA fiction, young adult fiction and tagged book reviews, books, dystopian fiction, extras, pretties, reading, science fiction, scott westerfeld, specials, tally youngblood, The Hunger Games, uglies, YA fiction, young adult fiction. Bookmark the permalink. When I came to the back matter at the end of I’d Know You Anywhere, I found myself surprised in several different ways. It turns out that Laura Lippman, the book’s author, is a former reporter for the Baltimore Sun and author of quite a few previous novels, many of them based, however loosely, on true crimes. This is not only the biography of a rather ordinary-sounding mystery novelist, but — and I’m sure this betrays some deep prejudice of mine — someone who is a bit of a hack mystery novelist, someone who dashes off clichéd suspense fiction in the flat, lifeless prose so typical of the bestselling novels one finds on the paperback bookshelf in the supermarket, next to magazines showcasing the scandalous lives of reality TV show stars. So let’s just say that I’m glad this back matter was precisely that: back matter. If it had been front matter and had come before the novel itself, I doubt that I’d ever have bothered to read what followed. Because I would have been completely wrong about Lippman. She isn’t a hack; she isn’t even really a mystery writer, at least not in this particular novel (though she takes a humorous jab at such hack “true crime” writers by casting one as a minor character in one of the book’s later chapters). Lippman’s tone is literary without being self conscious about it, the kind of prose that I love because it holds my attention without ever making me feel as though my attention is either being taken advantage of or flattered for its superlative taste. Lippman writes with intelligence that never spills over into pretentiousness. And while I can’t say that I’d Know You Anywhere is likely to be the best novel that I’ll read this year, it’s certainly the best I’ve read so far and I’d happily read any of the other dozen or so Lippman novels that are listed in that back matter. I’d Know You Anywhere is about a crime (one that Lippman says afterwards is based on a real crime though just in minor ways) but the novel doesn’t so much focus on the crime itself as on the people involved in the crime and how, despite the crime’s inevitable effects on their lives, they never manage to be anything remotely like the people you’d expect them to be. The specific story being told is about a 15-year-old girl who is kidnapped and held prisoner for 39 days by a young man who is afraid she has witnessed him murdering another teenage girl. The specific reason for that particular murder is left vague — deliberately, I think — but the young man has no intention of also murdering the girl he kidnaps. In fact, he seems to like her. He simply keeps her with him, driving around Maryland, Virginia and West Virginia (through many of the areas where I lived before I moved to California, so the book’s locales are hauntingly familiar to me). And then he lets her go. Though it is not a mystery novel, it does have a mystery: Why does he let this girl get away and not the other girls he’s killed? (There turn out to be several other victims.) I can tell you this without it being spoilerish because it’s part of the novel’s set up, not its resolution. The story is told long after the fact, largely from the viewpoint of the 40-ish woman that the 15-year-old kidnap victim has grown up to be, after she’s contacted by her kidnapper shortly before he’s to be executed; having exhausted all his legal appeals, he wants a last chance to talk to her. He won’t say why, but he insists on the opportunity to see her and the woman eventually gives in. It’s to Lippman’s credit that this isn’t a conventional suspense novel; she dwells very little on the possibility of any physical threat to the woman or her family, which now includes a rebellious daughter, a doting son, a loving husband and a large dog. Rather, she concentrates on the psychological aspects of the story: How was the now-adult 15-year-old changed by her kidnapping? Why did she stay with her kidnapper for 39 days when she had ample opportunity to escape? What was her complicity, if any, in the murder of his final victim, who was killed two days before the kidnapper released her? I’d Know You Anywhere is a novel that is extraordinary precisely it seems not to be extraordinary. In fact I suspect that it’s representative of what Lippman has been writing during the more than two decades that she’s been a novelist. What surprises me is that she’s been turning out fine prose like this so quietly in a genre — the crime novel — that I’ve generally kept my eye on, if only with mild interest, and that I wasn’t even aware of her. I strongly recommend I’d Know You Anywhere if you like crime fiction and have grown tired of the clichés of the genre. I doubt that I’ll wait very long before seeing if Lippman’s other books are as good as this one. Posted in book reviews, books, I'd Know You Anywhere, Laura Lippman, Mysteries, reading and tagged book reviews, books, i'd know you anywhere, laura lippman, mysteries, reading. Bookmark the permalink.